Senate leaders have proposed the biggest improvement to Washington state’s tax code since voters eliminated the sales tax on groceries in 1977, which made it easier for families with low incomes to afford the basics. Lawmakers should act now to strengthen the lives of all Washingtonians by approving the equitable tax reforms included in Senate Bill 5961. Despite the sales tax exemption on groceries, Washington state has the most upside-down state and local tax code in the nation, according to the Institute on Taxation and Economic Policy. Individuals and families with lower or moderate incomes pay up to six times more of their incomes in state and local taxes than the richest 1% in Washington. The tax code is especially costly to residents who are Black, Latinx, or American Indian because of a legacy of historically racist policies. To begin addressing the deep inequities in Washington’s tax code, the proposal from Senate leaders would tax capital gains – or the profits people make from selling corporate stocks, bonds, and other financial assets – of more than $250,000 per year at 8.9%. This tax, which would affect only 0.2% of the population, would generate about $800 million per year going forward. Most of this revenue would be used to equitably reduce taxes. About $220 million per year would be used to fund the Working Families Tax Credit, a commonsense tax refund program for lower- and moderate-income Washingtonians. Based on the highly successful federal Earned Income Tax Credit, the Working Families Tax Credit would reduce taxes and boost opportunities for hundreds of thousands of workers and families across the state. Another $185 million per year in revenue would be used to fund state and local sales tax breaks on common household necessities – including diapers, feminine hygiene products, over-the-counter medications, and medical and mobility equipment. 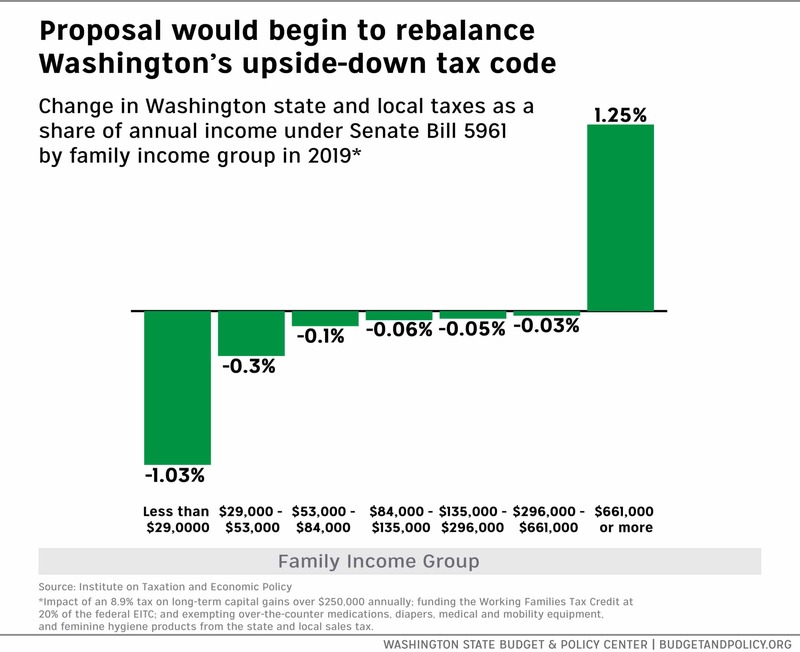 As the graph below shows, these changes would make Washington’s tax code more equitable. The capital gains tax would be paid exclusively by the very richest households in Washington state. Those earning $661,000 or more per year would pay, on average, an additional 1.25% of their annual incomes in taxes. All other Washingtonians would receive a tax cut through the new sales tax exemptions. The poorest households, who already face the nation’s highest effective state and local tax rates, would rightly see the largest tax cuts under the proposal. Washingtonians earning less than $29,000 per year would pay, on average, 1.03% less of their annual income in taxes, due largely to the WFTC (see graph). Most of the remaining capital gains tax revenue would wisely be used expand a property tax exemption program to more low-income seniors, veterans, and people with disabilities, and to expand a tax credit for small businesses. While not included in the graph above, both of these changes would make the overall impact of the bill even more equitable. See Associate Director of Fiscal Policy Andy Nicholas’s testimony in support of the Senate’s proposal to fix our tax code. Lawmakers should act quickly to approve this bill. Seniors with fixed incomes, workers with low wages, and families struggling to put food on the table have been saddled with the nation’s most inequitable state and local tax code for far too long. As we have previously written, taxing capital gains and funding a modern Working Families Tax Credit would begin to address the deep racial and economic disparities baked into Washington’s economy and tax code. There is no excuse for failing to take this necessary step forward for the good of our state and its people. Andy specializes in state budget and tax policy. Since joining the Budget & Policy Center in 2009, he has served on a Legislative Task Force on Tax Preference Reform and has conducted numerous analyses of Washington state’s tax code.